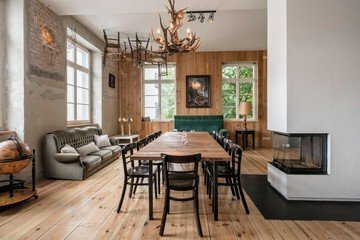 We're sorry, but space Private suite for functions inside stylish 19th century building in Berlin-Mitte is no longer available. The Grand is an event- and hospitality-location in Berlin-Mitte. The Grand is located in a former school building that was built in 1842. On three floors the location has almost 1,000 square meters of space you can use for your event. In addition to a bar, a restaurant and a club, The Grand still has six suites that can be used for various purposes. By public transport you get to the location by the subway U8 through the station Weinmeisterstraße in just a few minutes. The Jägermeister Suite is one of the six suites at The Grand. 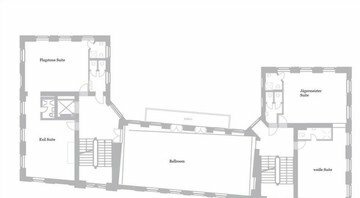 The 40 square meters suite has space for up to 40 peolple, depending on the event. 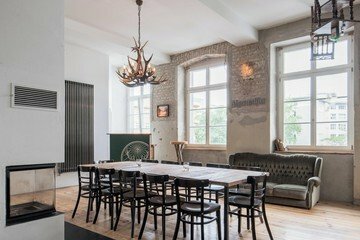 Rent the Jägermeister Suite as an unusual workshop-, meeting- or training-room. You can use the Jägermeister Suite for smaller events or for photo shoots as well.